As we starting incorporating Active Learning Centers in our Library, I noticed that most of them were geared toward Early Literacy. We began to brainstorm ways to engage toddlers, preschoolers, school agers and tweens. Actual Size was one of our first ideas. We took a page from the Steve Jenkins book, “Actual Size.” On a column in the Children’s Department, we measured increments in feet and labeled them with animals that were each size. In addition, we added facts about each animal and their sizes. Now as kids of all ages and even some adults walk through the room they can measure themselves and each other to discover that they are as tall as a sea turtle, a bear or a flamingo. This addition does not take up a lot of space and did not cost any money except for the paper and ink to print the pieces. There is very little up keep. The column we selected to put this activity on is right next to the 590 section so that after finding out what animal they share the height of they can check out a book to learn more! 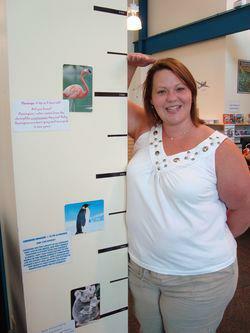 I am almost as tall as a pink flamingo! Words can hurt–books can help. That is a very cool idea! Thanks! I love this idea, both as a (hopefully) future children’s librarian and as a parent. My preschooler would get a huge kick out of it! What a great idea. I am thinking about where I can have it in my library. Thank you for an easy and educational decor idea. Love it! I cannot wait to do something like this in our library. Great idea! What a wonderful idea! I love Steve Jenkins! This is a great idea to post with a display of his books. Thanks for sharing.